Over Memorial Day weekend Lance and I drove to Chattanooga. I heard a lot of great things about it, so I was anxious to check it out. We drove about two hours north through Georgia and reached Chattanooga just after 1am. I knew we'd walk the pedestrian bridge, the Walnut Street Bridge, so I googled places to eat around it and found Milk & Honey. We sorted out the top things each of us wanted to do, and visiting Milk & Honey was one of mine. It was a great little treat after walking across the bridge from downtown. It's only a couple blocks away from the bridge in a little strip mall. Milk & Honey is beautifully styled and a sweet little spot for dessert, coffee or food. It has an outdoor seating area and a back room for extra seating. We sat at the counter on those adorable yellow stools. We ordered a strawberry tangerine paleta, pistachio gelato and a homemade cream soda. Everything we ordered was delicious, but the pistachio gelato really hit the spot. If we head out to Chattanooga again, I'd love to try out their brunch. So hey. I'm engaged. It's kind of crazy to say. But yet. I'm engaged. woot. so crazy. Here's just a little (long) story about our engagement and what lead up to it…..
Lance is just so good for me. We have so much in common, and we really balance out each other's strengths and weaknesses. Early on in our relationship I knew Lance was the one. When I realized I loved him I just knew that it'd either be him or no one at all. So much so that the first time he flew out here he met my family… all fourteen of them. Yikes. Poor guy. But he did really well, and that just kind of sealed it for me. Leading up to the engagement. We knew we were getting married, but we just had to work out one minor detail. We'd been dating for almost a year, with the entirety of it long distance. So for us to get engaged, we had to be in the same place. In July I had visited Lance right before he moved to Alabama to start his new job. We were hoping to get married in December so that didn't leave us a lot of time. To top it off, it wasn't in the cards for me to visit Lance in August since I had just gone in July for almost two weeks. For my work, I had to be in California in August. September and October would be crazy busy with weddings, editing and travel. On top of that, early fall is crazy busy for Lance. So even though August was "light" for me, it was hectic for Lance. So it was decided Lance would visit Labor Day weekend. And at that point I was hoping/expecting him to propose that weekend. In fact I had my heart set on it. I was very persistent in my questioning. Are you going to propose? Do you have the ring? Are we getting married? What's going to happen? What's your plan? My questions were endless. I'm horrible, I know. But Lance, of course, was great. He doesn't lie, so from the get-go he was very consistent in not answering my questions. He'd field my questions with "don't ask me's" or "let's talk about something else's" and other clever responses. 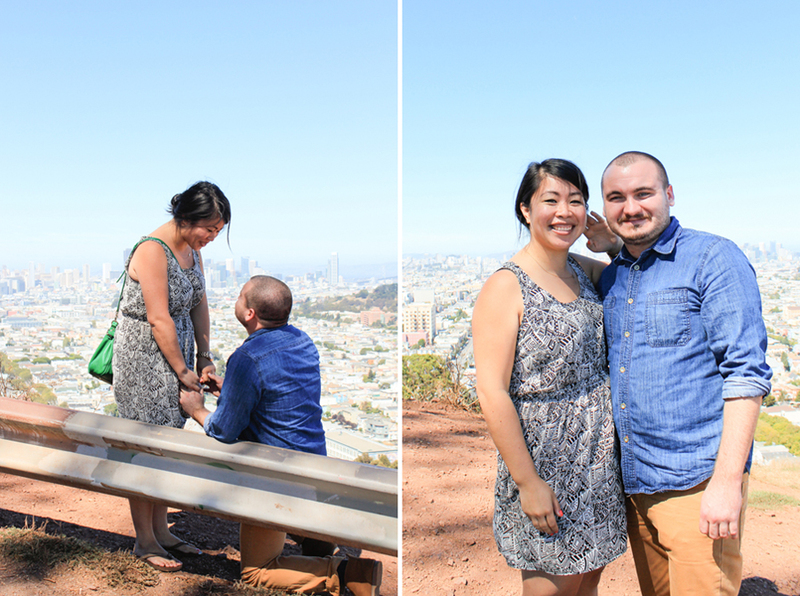 So that left me not knowing whether or not he'd propose…. basically really confused. Lance was going to fly in on Friday, August 29 in the evening. I'd become even more persistent in my questioning, and Lance continued to be a fortress of secrets. I really wasn't sure Lance would propose, but it seemed like a very logical assumption. After all, we didn't see each other all the time. But, still, I wanted to be prepared. Friday afternoon I got a manicure. Of course. With fresh polish I headed to SFO and met Lance at the airport. Because we're long distance, meeting each other at the airport is always very special to me. There's no feeling that compares to see him emerge from behind security. It's just great. I was sooo excited just to see him! 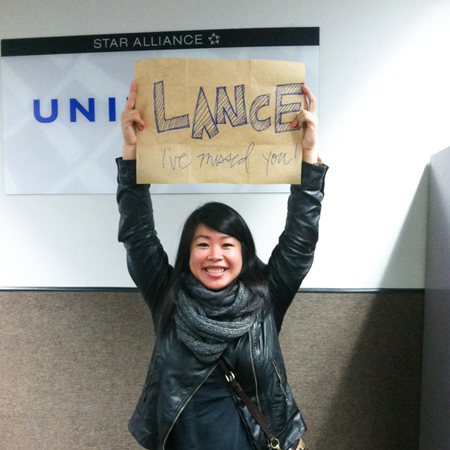 We were at baggage claim when I asked Lance which company he was picking his car up from. He pulled up his email on his phone to look for the reservation, and I glanced over. Immediately I saw the names Johnny & Terrysue, my brother-in-law and sister, in his inbox. For a moment I recalled my memory wondering if I had sent my family and Lance an email. I quickly realized I hadn't, and you can't mistake the name Terrysue. Then I had an asthma attack. He was going to propose. I knew it!! But then, Lance, being the leveled headed guy he was (and wanting me to enjoy the surprise) said, "Meg, you don't know what that email was. I don't want you to be disappointed. Don't have high expectations. You don't even know if I've asked your Dad for his blessing yet." So that was it. I was duped. At that point I told myself I didn't need a proposal that weekend. I remembered that I was just happy to be with Lance. I knew I'd knew it was going to be a great weekend with or without a proposal. Lance already had the ring and my dad's blessing. That morning I had actually gone to bed at 9am and talked to Lance before I went to bed. At that point Lance knew it'd be long before I'd wake up, so he took that opportunity to call my dad. They talked for an hour. Lance asked for my dad's blessing. My dad asked him lots of questions and ultimately gave his blessing. And he had been scheming with my sister-in-law, Alison. AND he had organized a dinner with all my family to celebrate the engagement. So everyone knew but me! When Lance visits I usually have a lot of ideas and suggestions and let him choose. He'd been working a lot so before he arrived he had asked that I leave our plans open. So that Friday night I asked what he wanted to do on Saturday. He said he had a plan and insisted we started the date early. I thought that was really weird that he was so specific about leaving at 9am. When I got home I called him up to ask what we were doing so I'd know what to wear. If we were going hiking or doing something active I wanted to make sure I was wearing appropriate clothing. He didn't want to tell me what we were doing, but he did tell me what he was wearing. And let me tell you this, his outfit was what I call his "fancy" outfit. Granted, he usually dresses pretty well, this outfit in particular is his outfit he wears when he wants to wear something nicer. So I thought…oh I'd better wear a dress. Meanwhile… I'm still incredibly confused. It seems like he's going to propose, but I didn't want to get my hopes up because it also seemed like he wasn't. And I was actually leaning more towards that he wasn't. Lance calls me up early Saturday morning to ask me to bring my camera so I can take head shots of him for his Linkedin Profile. 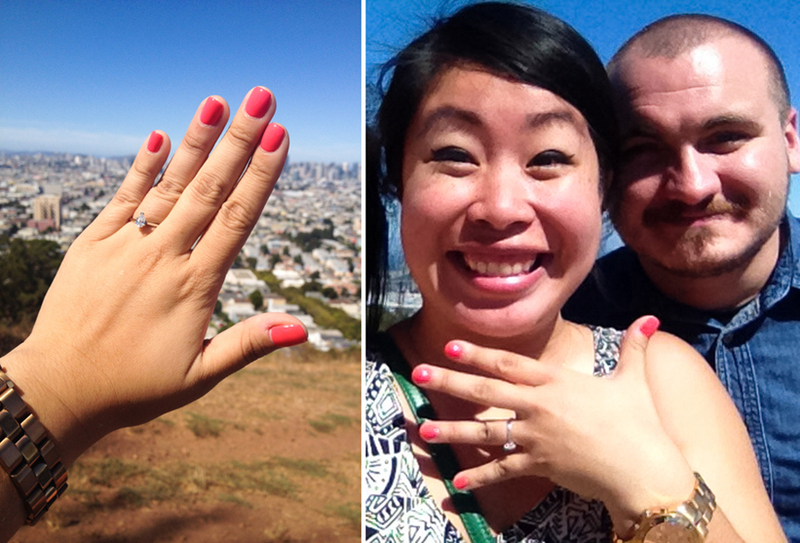 Then he tells me he wants them at Bernal Heights Park. First I think, that's not a good place to take head shots. Then I think, "Hey, that's we he told me he loved me." When I asked if he remembered he said, "Oh yeah." I had just had a photo shoot at Treasure Island, so since it was on the way I suggested we check it out. We park and take in the views of San Francisco. There's a vendor setting up his food cart, so Lance decides he wants a churro. The churro guy actually takes forever, and I'm actually getting annoyed with how long he's taking when I see the cooked churro sitting right there. Finally the guy gives Lance his churro. At that point I'm thinking we should hit the road. I'm the kind of person that once someone tells me a plan, I want to make it happen. But Lance wanted to continue soaking in the view and eat his churro. Finally we get back on the road. My navigation is giving us directions to the park, and we're a couple blocks away when Lance suggests we have brunch first. I'm growing impatient because I want to get to the park already. I have no idea that Lance has a plan, bless his heart. He's in a real good mood and just kind of going with the flow of everything. We get to the brunch place and it's simply adorable. Totally the kind of place I like. It's actually a spot I'd been wanting to try. He just melts my heart. He found such a cute little brunch, coffee shop. Yay. While we're eating our yummy food he suggests we head to the De Young Museum. We tried to go one time, but it was closed. So I thought I thought a museum visit was a splendid idea. The only thing was, he wanted to be at the park by 2pm and at that point it was already around noon. I didn't think it'd be enough time because the museum was 20-30 minutes from where we were, which was only a few minutes from the park. But he insisted that he wanted time to wander around the park. We were heading to church in San Jose at 5pm, so he wanted enough time to see the park, make a boba stop and get to church on time. Three hours was a lot of cushion time so I thought that was weird. But I went with it. Even though it took forever finding parking, we're making good time as we wander around the museum. I love museums. While we were checking out the exhibits, Alison texted asking what we were up to. I told her we were at the De Young and put out feelers, "We're leaving soon. What are you up to?" To which, she responded, "Oh it's about time to put the kids down for their nap." Nuts. Alison doesn't lie. I thought maybe she and my family would be at Bernal Heights Park waiting for us. I thought, "Oh well for that." Anyway at the De Young there's a courtyard that has this really beautiful underground cave thing that I wanted to show Lance before we left. As we're walking to the cave we hear music. We come to find out there's an a cappella quartet singing love songs. I'm thinking, "Woah. This is great. How beautiful." He's thinking, "How sweet is this that they're singing love songs, and I'm proposing to Meg today!" I decide to play the "Secret Life of Walter Mitty" soundtrack because we both loved the music and movie. I play the first song, "Step Out" by Jose Gonzalez, and Lance asks to put it on repeat. It's a really great, epic song. Lance is thinking, "This song is getting me amped to propose!" I just liked the song. haha. All day I was analyzing Lance's pockets for a ring box with no avail. So when we were getting out of the car I watched him to see if he'd get something out of his backpack. He didn't. So I thought, "Oh he's really not going to propose. Oh man. It's been a really great day. I just have to focus on enjoying my time with Lance." We walk up the hill to the main part of the park where you overlook the city. There's a bench where Lance told me he loved me that Lance wanted us to sit on, but two girls were sitting there. He seemed a little annoyed that we couldn't sit there. I suggested sitting on a flat rock, but he insisted on sitting on a metal fence thing. When we sat down he continued doing something on his phone and looking around. So I looked around to, kind of hoping to see someone I'd know, but I didn't so took pictures of stuff with my camera. At some point Lance throws his phone on the ground and asks me if I want some gum. Strange. I take the gum and see a little cloth in the gum pack. I recognize the cloth, it's similar to the cloths I use to clean my lenses. My heart starts racing, and I start to wonder if that's where he kept the ring. He takes my hand and tells me he loves me and wants to spend the rest of his life with me. He definitely surprised me. All day I thought he was acting strange, but I never really connected the dots. He did a great job planning out this proposal. It was so beautiful how it all happened. And I'm just so blessed to have such a thoughtful and caring future husband! And here's a fun video from Alison right after Lance proposed.